Our New Billfold Stairway Wallets are here! New season, new products! 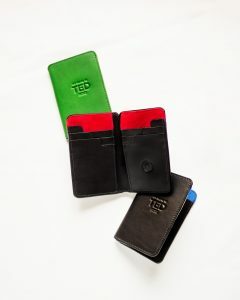 A very exciting week here in My Name Is Ted – with the unveiling of the Stairway Wallet. Similarly, to all our products, the wallet is hand stitched accompanied with curved edge leather. This detail that we proudly feature on our products requires an immense amount of skill, that must be passed down generation to generation. Our Stairway Wallet is made from 100% Full Grain Italian Leather & accompanied with our trademark luxury suede, you can guarantee it will be a head turner whether you are paying for the shopping, or a round of drinks. The biggest area of question we always get is people enquiring about the story behind the name – as we carefully select everything associated with our brand. In the case of this wallet, the card slots are designed like the steps of a rising stairs – with their main function being to allow owners to easily grip credit cards and remove when in use. The wallet has 6 card slots, a large area for cash and 2 secret components also – just in case you need to save a receipt or a voucher safe. The wallets are designed to be lightweight & slim – so they can comfortably fit in any pocket, whether it’s for front pocket, suit jacket or back pocket use. Typically, the stairway wallet will make a perfect Valentine’s day gift for the professional man – either newly graduated or a veteran in their respective industry. The packaging of the stairway wallet is made from rigid card with foil print. The packaging is designed to represent a book which symbolises Ted’s diary. Each wallet is also packaged with a luxury velvet dust bag, with a silk lining just for added luxury – from start to finish.